Masal vadai/Masala vada/Paruppu vadai is an yummy tea time snack recipe.My mom & mil make masal vadai without adding fennel seeds and mint leaves.We mostly make it for guest to serve in the afternoon lunch or for more kuzhambu.Sendhil likes that vada a lot.But i love masala vada only with spices.Before marriage,i used to buy masala vada from a tea shop.I would say it was the tastiest vada i’ve ever had in my life.She usually opens the shop at 11 am.All the vadas will fly in just 30 minutes.We have to rush before it sold out.She also makes urad dal vada,bonda and bajji.Once I asked her recipe secret and she told me roughly.Based on the ingredients she told and by referring vahchef’s site for some minute tips,finally i made a great flavoured crispy masala vada.I have mentioned the tips and variations in “Notes” section.Do try this crispy tea stall style masala vada.U’ll love it. Wash and soak the dal for 3-4 hours.Drain the water and set aside.In a mixie jar,take the chillies,salt,ginger,hing or garlic and fennel seeds.Grind it well.Then add half of the drained chana dal.Coarsely grind it to a paste(sprinkle only 1-2 tsp of water if needed.But its better not to add water at all).Some dals would be visible.Remove in a bowl.Grind in two batches. Mix both the batches well and add the finely chopped onions,curry leaves,coriander leaves and mint leaves.Mix well.Add 1 tsp of rice flour or corn flour if needed. Heat oil in a kadai for deep frying. Check the oil temperature by dropping a pinch of batter in the oil.If it rises immediately,oil temperature is just right.Simmer the flame and then make a small lemon sized ball from the batter.Pat it slightly.Make the corners slightly thinner than the middle. Drop into the oil.Make some more vadas and deep fry them in both the sides till onions & vada turn golden brown color.Remove, drain the oil in a tissue paper.Proceed the same for all the batter.Serve hot ! Pat the vada little thin to maintain its crispness.Do not cover the vadas when it is hot.It makes the vada soft and soggy. Add jeera if u don’t like fennel seeds.Some people do not like the over powering masala smell.In that case,skip it. For variations,replace green chillies by red chillies.I mostly use red chillies.This time i made with green chillies. U can replace hing by garlic cloves.Add 4-5 cloves in this case. If u soak the dal for more than 3 hours,u can grind it without adding water.In that case add little rice flour or besan flour or corn flour for binding. 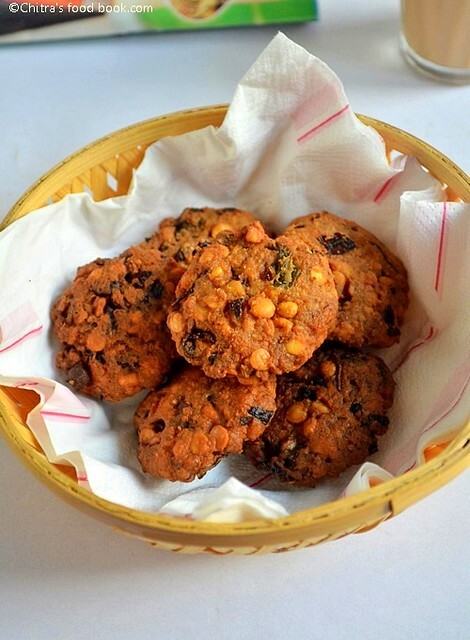 U can also make this vada by soaking the dal for 45 minutes but u have to add little more water while grinding.But the result will be the same. Adding ginger is completely optional.But it helps for digestion of vada. Addition of oil helps for binding the batter as well as crispness. If u feel the batter is watery or wet,add little rice flour corn flour or besan flour.Mix well and make vada. Addition of fennel and mint leaves gives the taste like u get in tea shops.So never skip it. Serve hot n crispy vada with tea ! Masal vadai looks so tempting...perfect with combo with a cup of tea. Nice tip of adding hot oil to the batter. 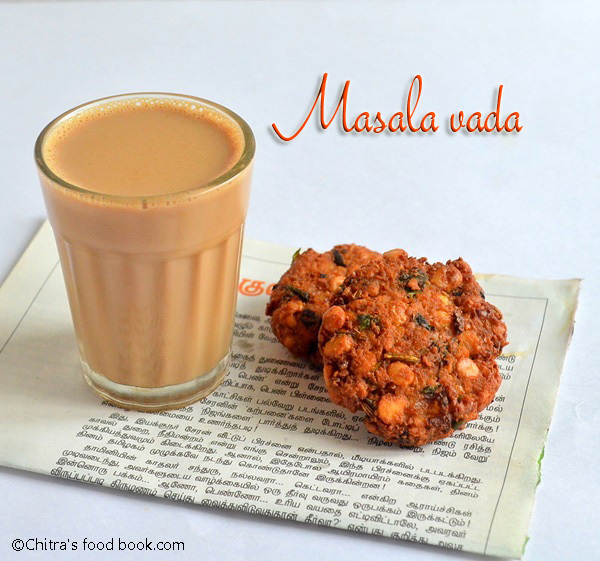 tasted masala vadai a lot never tasted with Tea.. i should try this combo ! looks so crispy n inviting!! one of my fav vada.. nothing beats this combo! vada and tea! looks sooo crispy n inviting..
Vada and tea, perfect for this weather..
One of my favorite vada..done it perfectly..
Too good and crunchy da..okok Plan up the list for me..
Planning to try this tomorrow for more kuzhambu. Few doubts, 1. Should we grind the green chillies, should we add ginger along with garlic to grind. 2. How to take photographs of vadai in hot oil using slr camera? Won't the vadai get burnt? Hi Chitra, thank you for posting the wonderful recipe with the detailed steps. I had been quite intimidated by the thought of making masala vadai at home till I came across your blog by accident. I made them for the first time today and they came out exactly like yours in the picture:). The only variation that I made was adding both garlic and hing. They were scrumptious and my otherwise reticent husband was all gaga over them. So thank you once again and keep up the good work!